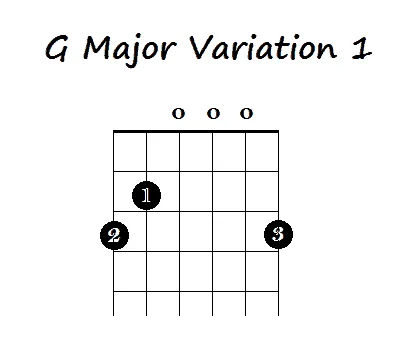 The G major chord is one of the first chords learned by most guitarists and it’s a go to in a huge number of songs. But many guitarists only know how to play it one or two ways. This post will show you 5 different ways to play the G chord on guitar. 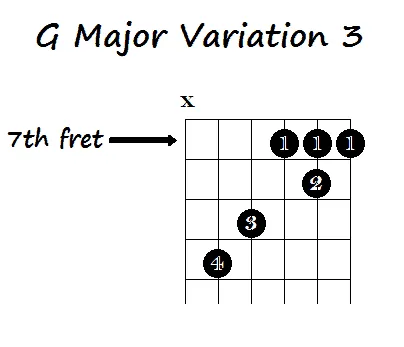 This is the most common way to play a G major on guitar. You most probably already know this one but I will include it here for completeness. All strings are strummed when strumming this chord – so the D, G & B strings are played open. There is a slight variation on this which is also very common. It’s the way I naturally play this chord. I find this has a slightly “fuller” sound to it. 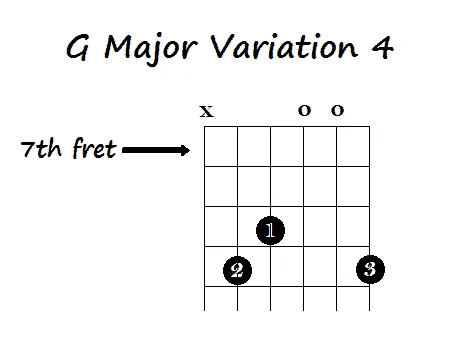 The next most common version of G major is the Barre chord. The Barre G is played by barring the 3rd fret over all the strings with your 1st finger and creating the open E shape in the 4th & 5th frets. All the strings are strummed when strumming this chord. If you aren’t sure about how to play barre chords check out the link below. You can also play an “A String Barre G”. This is played by barring all but the Low E string in the 10th fret with your 1st finger and making the open A shape in the 12th fret. Again, if you aren’t familiar with how to construct barre chords, see the link above. This a good mid fingerboard option. Only strum from the A string down. Don’t strum the low E string. Some people find it easier to use the 1st finger to barre from the A string down – this also allows you to use the tip of your index finger to mute the Low E string so you can strum more freely without worrying about hitting that Low E string. 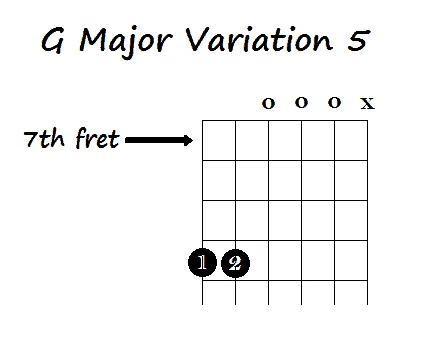 This variation gives a G major chord option that is higher up the fretboard. It has a significantly different flavor to the Barre chord that you can play in this area of the fingerboard. Strum all but the Low E string when you are strumming this. This is nice easy one to finish and nice sounding (IMO). It also has a few nice variations to it – they still keep it a G major chord but can add something extra or it can be minimized when that’s more appropriate for the sound you’re looking for. Technically this is a G with a D bass. Strum all but the high e string. Use 2nd & 3rd fingers in place of 1st and 2nd above and place the 1st finger in the 9th fret of the D string. Only strum down to the G string (or you can also strum the B string as well but I like this without the B string). Place your 3rd finger in the 10th fret of the high E string and now strum that string as well. I hope this post has given you some different options for playing the G major chord. Do you have any other ways that you like to play G major? Feel free to leave a comment below.